Want to create a virtual trade show booth that moves prospects along the sales cycle towards a purchase? 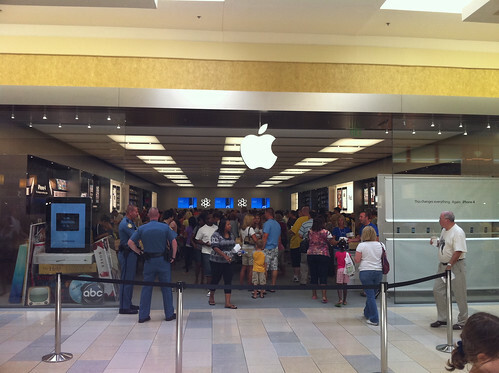 Head into an Apple Store and apply a few lessons from your visit. A recent article in the Mercury News referenced a Yankee Group analyst who “estimated that Apple Stores pull in about $5,000 per square foot in revenue per year, blowing away even Tiffany’s roughly $2,700 per square foot.” While I don’t expect virtual trade show booths to directly sell products, there are many lessons we can learn from The Apple Store. While visitors to an Apple Store are predisposed to purchase an Apple product, visitors to your virtual trade show booth are more likely in need of a solution to a business problem. Every virtual trade show booth should have a Genius Bar – a set of Subject Matter Experts (SME) to help visitors solve their business problems. While Apple’s Genius Bar provides product-specific advice, your Genius Bar should focus first on solutions (for your prospects) and secondarily on your own products and services. Make yourself indispensable to your prospects. Photo credit: James Cridland on flickr. Apple Stores are unlike any other retail environment. The entire width (and length) of the stores are all about the products. 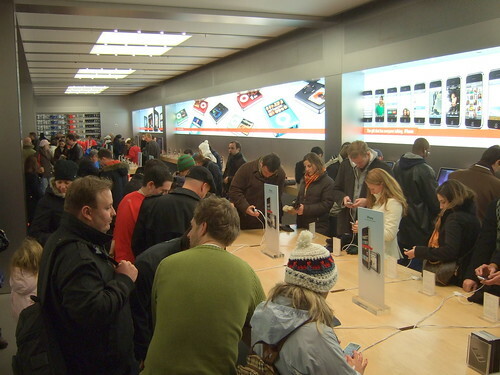 There’s a nearly endless supply of iPods, iPads and Macs for potential customers to try out. Of course, in a virtual trade show booth, you can’t provide an storage array to touch and feel. You can, however, build digital representations of your products and invite booth visitors to “touch and feel” (digitally). I mention related technologies (to enable this) in the “Touch and Feel the Products” paragraph of my Virtual Trade Show 2.0 post. If you’re a software company, you should find ways to allow visitors to interact with your software directly in the booth. If you’re a design agency, your virtual booth should reflect your design principles and capabilities. All too often in virtual trade show booths, visitors leave the booth feeling “unloved.” In a prior post, I wrote about a flight attendant call button for virtual events, which could be used to request technical support, among other things. All virtual booths should have a “Talk to a Specialist” button. Booth visitors who click the button are likely to be your hottest leads, so you’ll need to ensure that your “geniuses” are available to take the call. First, make yourself indispensable to prospects. Then, give them the product to “try before buying,” while making “geniuses” available to answer the “call button.” That’s the lesson I learned from The Apple Store. You are currently browsing the archives for the Virtual Trade Shows category.